The Edison "H" was Edison's first spring-motor coin-operated phonograph. Introduced in the fall of 1898 at a very substantial $50 (equivalent to nearly $1,500 in today's dollars), the H had a very short lifespan -- late 1898 to 1900. Yet despite that short production period, there were two distinctly different versions produced. Both used the same cabinet, with an Edison 'Suitcase' Home mechanism, but the two versions differ in several details. This is the second model, with a chain-driven return mechanism to reset the reproducer stylus to the beginning of the record. The earlier version had a string-driven return and a rubber tube rather than metal linking the reproducer to the horn. The mandrel is made of rubber-coated brass. The rubber was meant to minimize the difference in expansion and contraction due to temperature changes, which could easily cause a fragile brown wax record to crack when left on a regular brass or nickel-plated mandrel. The Edison H was expensive, bulky, and very heavy (45 lbs. ), and was not a very popular machine. Only about 12 are known to survive today, of both types. In 1901 it was supplanted by the much more popular (and slightly smaller) "Excelsior", which was based on the "Standard" and remained in the Edison catalog until 1908. It was a more manageable size but it still sold at the same $50 price, significantly more than competing coin-operated cylinder machines made by Columbia Graphophone. My old friend Dave Heitz had a massive collection of coin-operated phonographs, occupying a full room. He always told me his Edison H was the most difficult to keep in running order. Steve Farmer, the renowned restorer who rebuilt my H mechanism commented that "The people that designed the H machines must have ended up in an asylum or maybe they were let out to design this thing." It is truly a Rube Goldberg device, very complex and delicate, and incredibly sensitive to adjust. Interestingly, the Columbia BS was introduced at the same time as the Edison H, but at only $20 it was less than half as expensive. It is much smaller, not as loud, but mechanically it is much simpler and unlikely to go out of adjustment. It is vastly more reliable than its far more expensive Edison rival, which is no doubt why the BS is the most commonly found coin-op phonograph today, while the H is one of the rarest. This machine has a superb original finish, however like many coin-ops that outlived their useful service lives, this was "de-commissioned"and some of the coin parts were removed in the early 20th century. That is true of most coin-operated phonographs today. The missing parts have been re-made directly from originals by master restorer Steve Farmer and it now looks and operates as it did in 1899/1900. The hand-written title sign in the top frame is original, a very rare find in itself. 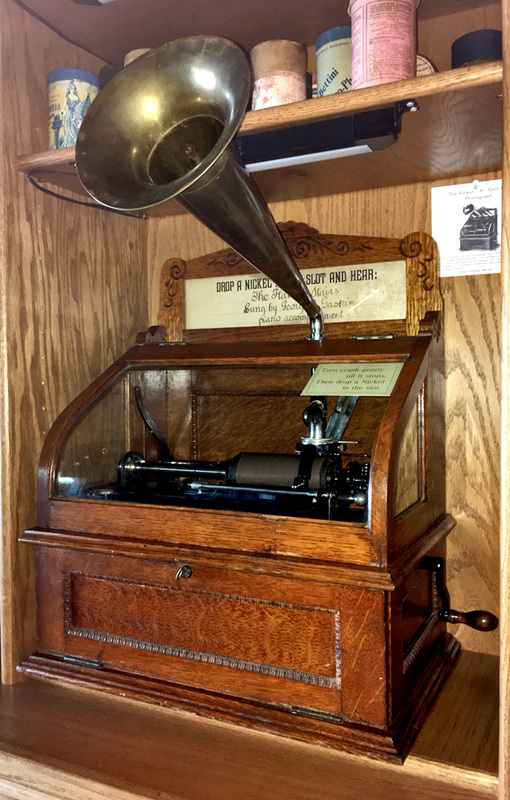 The new Edison spring-motor coin-operated phonograph was announced in the August, 1898 issue of Phonoscope, and entered the market soon thereafter.